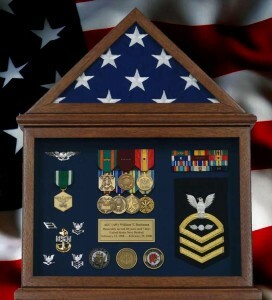 Flag display case with Navy ribbons, medals, rank patch, custom nameplate, pins and insignia. What is a flag display case? People tend to define a flag display case as a triangular-shaped box that holds a folded flag, with the flag’s stars at the top. The most common of these triangular-shaped display cases are used for burial flags. In fact, most searches on the internet turn up a display case for a burial flag. We have re-defined the term “flag display case” into a broader definition, as it relates to our customization of flag display cases. For us, a flag display case is a custom built frame designed to hold mats with flags, guidons, memorabilia, and personal objects. The personal objects included in the flag display case may include: Awards, Certificates, Coins, Distinctive Unit Insignia, Dog Tags, Medals, Military Commendations, Nameplates, Photographs, Souvenirs, Ribbons, and other personal memorabilia of significance. 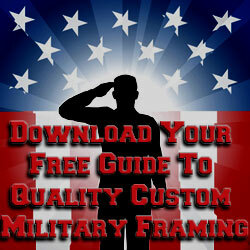 We custom design and build flag display cases in a number of ways to frame military memorabilia. First, a custom flag display case can be highly customized—holding a flag and a large number of objects. At other times, we frame memorabilia in the simple, burial-style flag display cases. Our customers overwhelmingly prefer a customized flag display case to display a flag and the military items that signify their career. Sometimes the flag display case becomes a large shadow box with a flag and personal items. We custom frame flags that range from those that were flown in combat theaters, to new flags, to burial flags. We have even framed golf and fishing flags with personal items. We custom frame flags using conservation framing techniques that include acid-free materials, 99% UV protective glass or acrylic, and sewing our flags in place to ensure they do not fall or sag later. 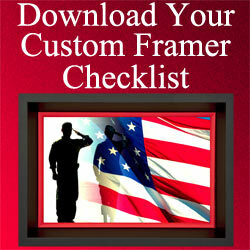 We offer premium framing services that reflect our standards of high-quality flag framing. 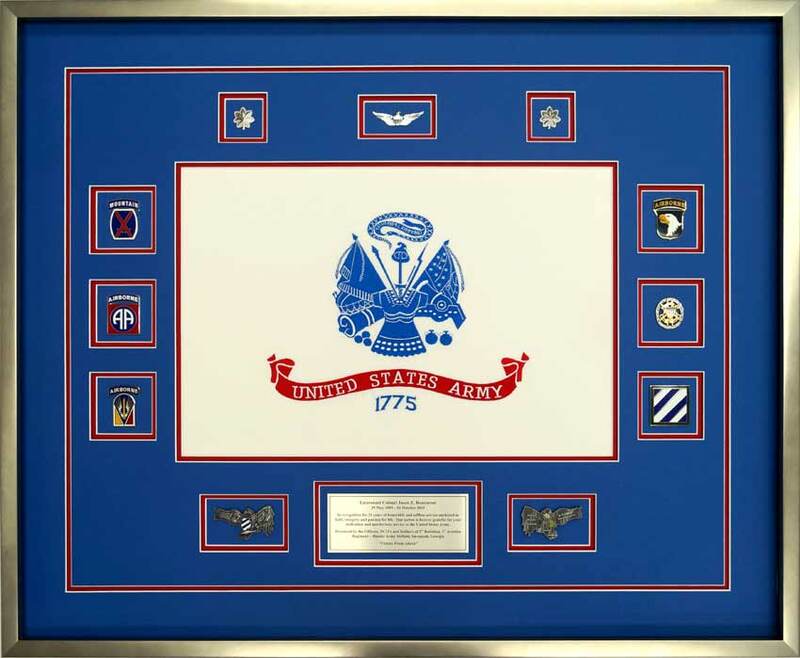 The framed US Army Flag on the left is representative of a custom designed flag case that enhances the presentation of the flag. The US Army Flag Case design features our signature open V-groove that surrounds the objects and the Army Flag. A common inclusion in a flag case is specialty pins for aviation, rangers, and special forces. In this case, there is an aviation pin, rank pins, a custom laser engraved nameplate, and distinctive unit insignias. A flag display case makes a great gift for retirement, for honoring a deceased veteran, for change of command gifts, and for displaying objects with the flag of personal significance. 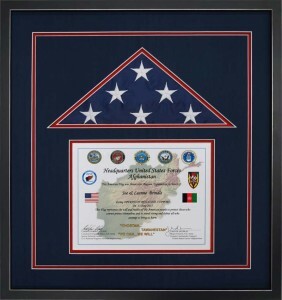 We offer a number of framing design options for framing flags. In this case, coins were included in the flag display. 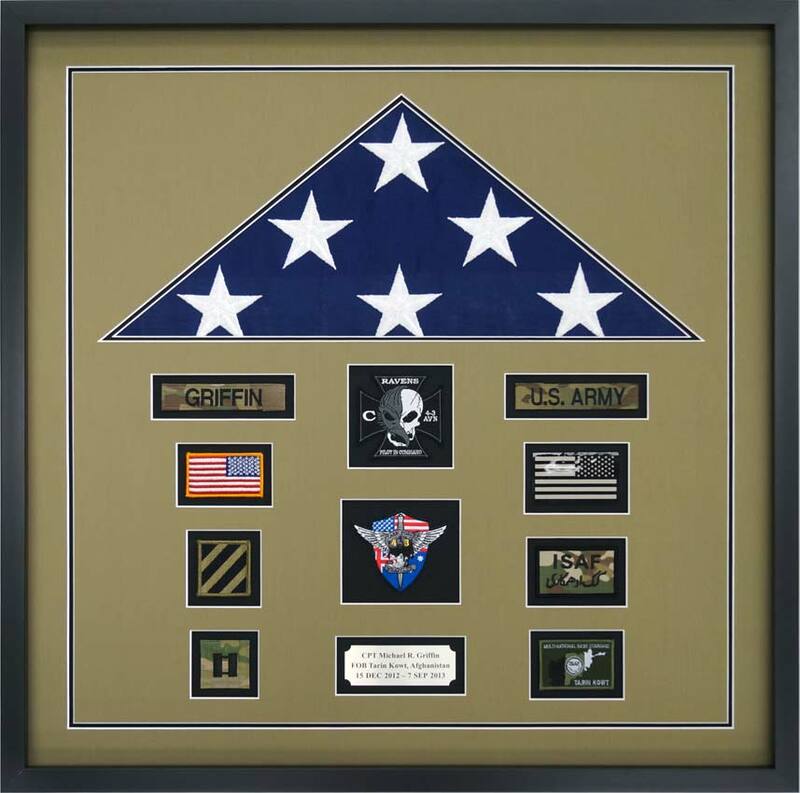 Our customers frequently place additional items such as distinctive unit insignia and other mementos that reflect the location of where the flag was flown. This is a large, complex “Army Flag Display Case” custom designed to reflect a soldier’s distinguished military career. 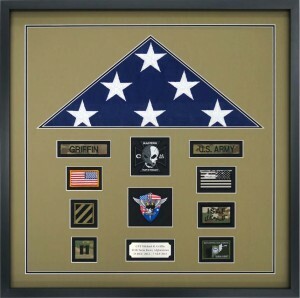 This is a large, complex “Army Flag Display Case” custom designed to reflect a soldier’s distinguished military career. 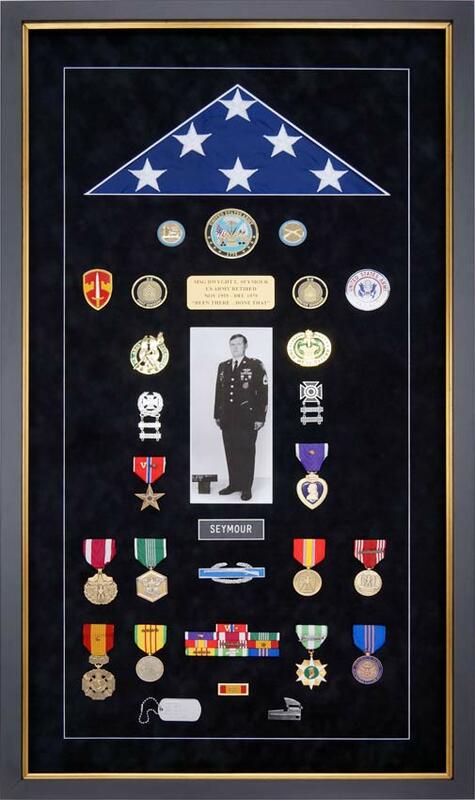 Upon retirement, many veterans use a flag display case, or a shadow box, to display their pride at having served their nation. One of the ways this is frequently done is by custom framing an American flag with items that were part of their uniform during their career. In addition to framing uniform pins and insignia, challenge coins and personal items are added to the custom flag display case. 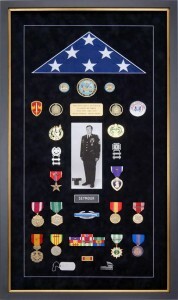 For the example of a complex flag display case on the left, elements in the flag case design include Army collar insignias, the Purple Heart, the Bronze Star with V for Valor, the United States Army First Sergeant 1775 Military Challenge Coin, Marksmanship badges, distinctive unit insignia, the Vietnam Service Medal with 4 Campaign Stars, the Republic of Vietnam Campaign Medal, the Meritorious Service Medal, the Meritorious Civilian Service Award, the Combat Infantry Badge, a Dog Tag, a Uniform Nameplate, a Custom Engraved Nameplate, the Drill Sergeant Identification Badge, the US Army Recruiter Badge, a P-38 can opener, and a US Army Uniform picture. It also contains ribbons that match the awarded medals. The design elements of this custom flag display case include a plush single black suede acid-free mat, a popular black all wood frame, with a gold tone fillet. The mats were cut to provide a triangular opening at the top for placement of the folded flag, with the stars pointing up. A standard white line v-groove surrounds the objects inside the case. The selection of a black mat and a black frame with a gold-tone fillet contrast exceeding well to highlight the medals and awards mounted on the mat. This is a premium display case custom designed and custom made. We offer variations of this design, with framing options that include items specific to an individual’s preference or taste. Also available as a design option is our signature open V-groove. Example of a Simple Custom Designed and Custom Built Flag Display Case. Honorable Americans show their patriotism in a number of ways. A very popular and meaningful way to show that patriotism is by proudly displaying an American flag flown in a combat area or during a combat mission. A simple, custom-designed flag display case is an option we offer for displaying one of these flags. In the example on the left, the simple flag display case contains an American flag flown in Afghanistan during Operation Resolve Support. The flag is accompanied by the signed certification that it was actually flown during the operation. 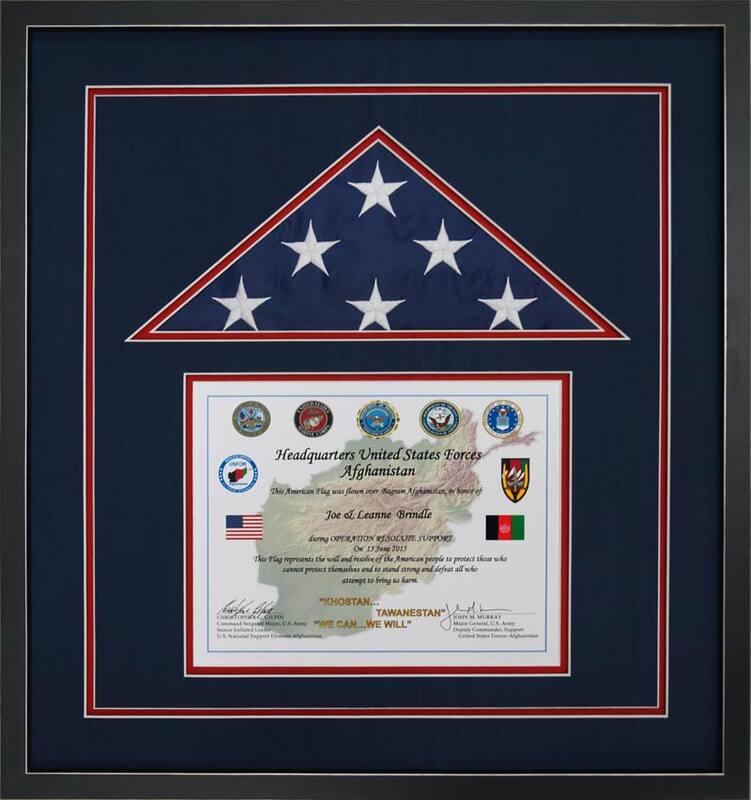 This example of a custom flag display case features the American flag and the certificate. Rich, silken, double acid-free mats closely match the flag’s nylon fabric texture. A custom triangular opening was cut into the mats for the flag. The flag was folded into a position that reveals the stars in a precise triangular pattern for display. Then, the flag was hand sewn in place to prevent it from shifting over the years. The navy blue and red mats, with their white reveals closely match the patriotic colors of the flag. Both the flag and the certificate are surrounded by an open V-groove which shows the red mat peeking through the opening in a linear pattern. The open V-grove is our signature design element that adds depth and separation to the display case design. 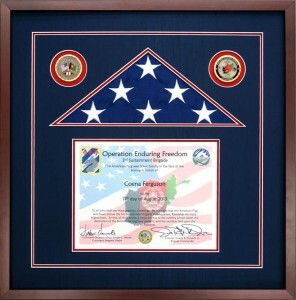 This flag display case features one of our popular frames for military and patriotic designs. The frame is constructed from black, all-wood moulding , with silver edging. The flag, certificate, and the silken mats were covered with 99% UV protective glass to prevent fading. This UV protection ensures the longevity of the flag, certificate, and mats inside the display case for future generations to enjoy. Although this is a simple display flag case, we offer premium upgrades for the inclusion of additional objects, additional frame choices, and 99% UV protective Museum Glass–which is nearly invisible. We have framed flags flown in combat areas that also include distinctive unit insignias, patches, and even photographs in the flag display case. This is an example of a Flag Display Case commemorating a soldier’s deployment to combat duty. The display case on the right features the 4th Battalion, 3rd Aviation Regiment insignias for the Ravens and the Brawlers, name tapes, 3rd ID patch, a custom laser engraved nameplate, rank patch, uniform flags, and an American flag. 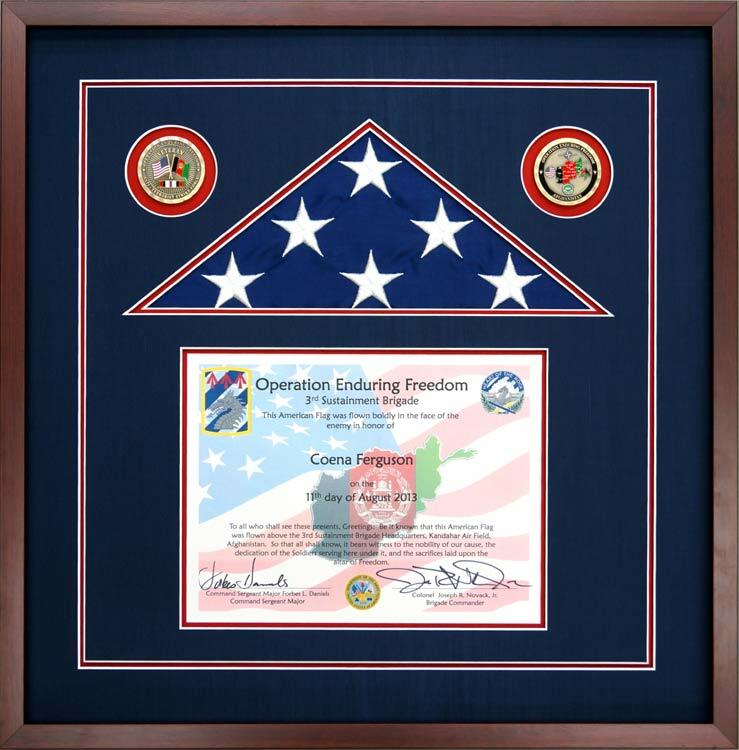 The collection of memorabilia in the flag display case was designed to commemorate deployment to the Forward Operating Base Tarin Kowt, Afghanistan. The desert buff and black mats used for this flag display case were acid-free. A custom triangle shape was cut into the mats at the top to hold the folded American flag, with star tips pointed up. A wood, matte black finish frame complements the mat colors and design for the objects inside the flag display case. An open V-groove surrounds the objects inside the frame. The mats and the objects are covered with 99% UV protective acrylic. One of our specialties is creating and building flag display cases. We approach the design of each flag framing project as a unique opportunity to honor the flag. We do this in a respectful and meaningful way that also honors our customer. Our mission is to produce a design for a flag case that truly provides many years of viewing pleasure to our customer and to future generations. We invite you to visit our shop or contact us by either phone or e-mail with any flag case inquiries. We will be more than happy to provide ideas for framing flags.